First and foremost, the eye will immediately be drawn to Gusev’s name after reports this morning indicated that he may be on his way to the Vegas Golden Knights instead. While Darren Dreger of TSN reports that Gusev’s representation is working to get him out of the last few weeks of his contract with SKA, the Golden Knights themselves have refused to comment on the situation. It’s not clear at this point if he will be allowed to join Vegas for an NHL playoff run, or if Gusev is instead going to join the national team and participate in the upcoming tournament. Next is Provorov, who is set to become a restricted free agent this summer. Players often avoid going to the tournament if they don’t have a contract for next season due to the injury risk, but perhaps the Flyers have already done work to remedy that situation. In fact, the Russian press release indicates that Provorov will “join the team after he signs a new contract” indicating that they might not be waiting very long. The tournament starts on May 10th, well before Provorov would actually become an RFA. Dadonov and Anisimov will also not be joining the Russian team right away. The former is dealing with a minor injury and will have to be cleared by the Panthers before reporting, while the latter is said to be joining the group on April 26th. In a move that signals the Chicago Blackhawks understand their own limitations this season, Henri Jokiharju has been loaned to the Finnish World Junior Team for the upcoming tournament. Pre-tournament games start this week, and Jokiharju could be away from the Blackhawks until early January depending on how things go. The 19-year old is still eligible despite playing in 32 games for the Blackhawks this season. In related moves, the team has also activated Artem Anisimov and Gustav Forsling from injured reserve. Jokiharju has been one of the best players on the Blackhawks all season, but given the team’s struggles through the first part of the year it makes sense to allow him to compete. The right-handed defenseman will immediately become Finland’s go-to player on the blue line among a group of fairly inexperienced teammates. Miro Heiskanen, who would also be eligible for the tournament, is playing big minutes in Dallas meaning there is ample opportunity for Jokiharju. With 11 points in 32 games for the Blackhawks, the tournament should be even easier for him. Still, it’s an interesting decision this early for Chicago. The team was expecting to compete this season with the likes of Jonathan Toews, Patrick Kane and Duncan Keith still leading the way, but have dealt with injury and inconsistency through the first few months. That cost former head coach Joel Quenneville his job, and with Corey Crawford’s latest injury the season may be lost already. The Blackhawks sit in 30th place in the NHL with a 10-19-6 record, and are looking towards a future that relies on Jokiharju as a minute-munching two-way defender. Going to compete in the World Juniors is a strong development tool, and one the young defenseman will likely relish as he tries to lead his country to a medal. 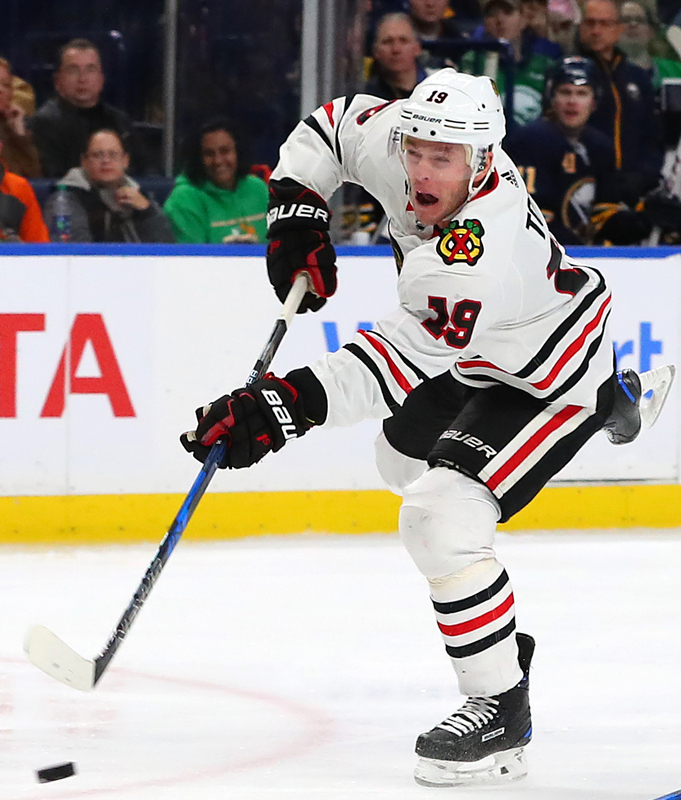 The Chicago Blackhawks have recalled Dylan Sikura and Carl Dahlstrom from the minor leagues while assigning Alexandre Fortin to the Rockford IceHogs. The team also placed Artem Anisimov on injured reserve while he deals with a concussion. Sikura, a standout at Northeastern University over the last several seasons, is off to a great start in his rookie season in the AHL, scoring 18 points in 26 games. Rourke Chartier is on his way back up to the San Jose Sharks, recalled today from the AHL. The 22-year old forward has played 13 games for the Sharks this season, recording his first NHL goal but failing to register another point. The fifth-round pick has found some early success in the minor leagues, but will have to continue to prove himself if he wants a full-time role in the NHL. Jordan Kyrou has been assigned to the AHL’s San Antonio Rampage, leaving the St. Louis Blues after a short call-up. Kyrou, a top prospect in the Blues’ system, has yet to prove that he belongs at the highest level despite some prime opportunities. The young forward will continue his development in the AHL for the time being, while St. Louis gets Jaden Schwartz back into the lineup. The Los Angeles Kings have moved Alec Martinez to injured reserve, while recalling Daniel Brickley from the minor leagues. Brickley signed as an undrafted free agent out of Minnesota State University-Mankato last spring, has just 22 professional games under his belt so far, all but one coming at the minor league level. The 6’3″ defenseman needed an opportunity to show what he could do at the NHL level, and Martinez’ injury may just be that chance. Paul Carey is on his way down to the AHL, as the Ottawa Senators announced that they have reassigned the veteran to Belleville. The free agent addition was only recalled on Sunday and did not see the ice with the Sens. Carey has only five NHL games to his credit this season, all back in October, and no points to show for it either. The two-way forward has been close to a point-per-game player for Belleville in 20 games, but Ottawa seems hesitant to give him much of an opportunity just yet. The Columbus Blue Jackets will take another look at veteran forward Zac Dalpe, who they have recalled from the AHL’s Cleveland Monsters. Dalpe has been with the club for more than two years and played in twelve games with Columbus last year, but has only one NHL appearance so far this season. Dalpe has been remarkably productive in Cleveland, with 25 points in 24 games, but has struggled to translate his production to the top level throughout his nine year career. The Blue Jackets will see if he can be more than just a body on this most recent promotion. After adding Chad Johnson on waivers, the Anaheim Ducks have sent goalie Jared Coreau back to the AHL, the team announced. In exchange, they have called up rookie defenseman Josh Mahura from the San Diego Gulls. Mahura has already logged six games with the Ducks in his first pro season and could see more opportunity on this latest recall. The Columbus Blue Jackets added Mark Letestu yesterday for their playoff run, but had checked in on several other options before making the deal. Mark Lazerus of the Chicago Sun-Times reports that the Blue Jackets offered a third-round pick for Artem Anisimov, hoping the Blackhawks would also retain some salary. Elliotte Friedman of Sportsnet also believes that the Blue Jackets asked about Patrik Berglund and Vladimir Sobotka of the St. Louis Blues, but obviously didn’t make a deal. Letestu ended up only costing Columbus a fourth-round pick, which certainly doesn’t take them out of the running today for an additional upgrade. Scott Powers of The Athletic reports that the Chicago Blackhawks are looking for a first-round pick plus another asset for Ryan Hartman, a big ask for a young player with just eight goals this season. Hartman, 23, is a versatile player that could draw interest from many teams, and is a restricted free agent this summer. That could be part of why the Blackhawks are considering moving the forward, as like most years they’ll have some tough decisions to make on their young free agents due to their ongoing cap crunch. Antoine Vermette was held out of the lineup last night for the Anaheim Ducks, and John Shannon of Sportsnet reports on his eight-team approved trade list. Shannon explains that only two of those teams are currently in playoff spots, which could drastically limit any return should the Ducks decide to move him. Vermette is affordable and playoff-tested, but ultimately holds a lot of power in deciding whether he’ll be traded today. While Ken Holland is selling assets off following his deal of goaltender Petr Mrazek to the Philadelphia Flyers, he’s quick to caution that it’s not a full rebuild while adding that the Red Wings are “open for business.” NBC Sports’ Sean Leahy notes that Holland and the Red Wings are about to go through some “pain” in order to return to the higher echelon of the NHL, and even then, Holland may not be around to see the full plan in motion. Leahy writes that whether Holland ends up going to Seattle or if the Ilitch family decides that they will move on to a new general manager. Regardless, Holland will not do an entire teardown, preferring to retool the Wings in a gradual sense. Whether that works or not, it will take some time for Detroit to see the fruits of those labors. Elliotte Friedman offered his 31 thoughts as the deadline nears. One such thought was that the Chicago Blackhawks prefer to hold onto Artem Anisimov since centers don’t exactly drop into teams laps all that often. Because of the language in his contract, Anisimov has less choice as to where he can go starting July 1, so should interested teams call, he can be pickier now with a no-move clause than a partial no-trade this summer. Friedman adds that after the Michal Kempny deal, the Blackhawks are focused on getting what they can for impending UFAs which include Lance Bouma, Jan Rutta, Tommy Wingels, and Patrick Sharp. Friedman also pours some cold water on any hopes that John Carlson could reach free agency. Saying the Caps and Carlson seem “very comfortable” to discuss contract terms at the end of the season, teams hoping to snag the 28-year-old defenseman may be disheartened to read that. Freidman attributes the Steven Stamkos Sweepstakes (that never were) two seasons ago as a reason why teams are not nearly as “scared” when it comes to later negotiations. Stamkos, of course, seemed to be linked a new team every day until he inked an eight-year, $68MM extension. The Detroit Red Wings announced they have recalled defenseman Joe Hicketts from the Grand Rapids Griffins of the AHL today. The team recalled the diminutive Hicketts after defenseman Trevor Daley suffered a lower-body injury. Despite being 5-foot-8, 180 pounds, Hicketts has proven to be a one of the Griffins most physical players and many have felt deserves to be getting playing time with the struggling Red Wings. How much playing time he will get is unknown, but the 21-year-old undrafted free agent has two goals and six assists in 43 games this season. CapFriendly also reported that after activating forward J.T. Compher off of injured reserve Saturday, the Colorado Avalanche also placed forward Sven Andrighetto on injured reserve with a lower-body injury to make room for him. The 24-year-old Andrighetto has missed seven games and hasn’t played since Dec. 31. The Athletic’s Scott Powers tweets that the Chicago Blackhawks have assigned defenseman Gustav Forsling to the Rockford IceHogs of the AHL. The 21-year-old defenseman has been with the team all season, having played in 41 games. He has three goals and 10 assists, but needs to build his confidence, according to Chicago Sun-Times reporter Mark Lazerus. The move opens a spot for forward Artem Anisimov to return to Chicago’s lineup. Anisimov has missed the team’s last 10 games with an upper-body injury. 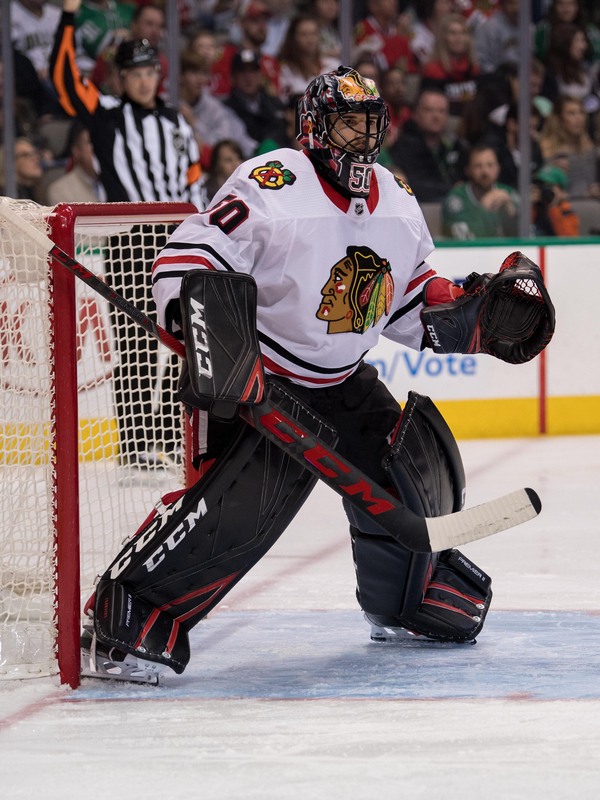 Blackhawks head coach Joel Quenneville told Mark Lazerus of the Chicago Sun-Times that it is his “expectation and hope” that goaltender Corey Crawford will return at some point this season. He also acknowledged that the netminder has done very limited workouts since being shut down with what has been reported to be vertigo-like symptoms and that they won’t be able to provide any sort of timetable for a possible return until he is able to resume working out. 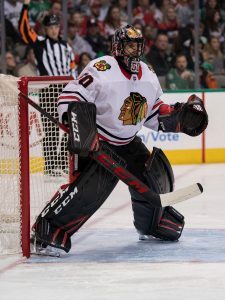 In the meantime, they will continue to go with a tandem of Anton Forsberg and Jeff Glass although a trade for short-term help can’t be ruled out either. In a separate column, Lazerus also reports that Blackhawks center Artem Anisimov returned to practice on Friday for the first time since suffering an upper-body injury in late December. While he won’t play today, he could be back in the lineup as early as Monday against Tampa Bay and should slot in somewhere on the second or third line. Wild winger Nino Niederreiter has suffered a setback in his recovery from a lower-body injury, head coach Bruce Boudreau told Michael Russo of The Athletic (Twitter link). As a result, he is not expected to return until after the All-Star break. Niederreiter sits tied for third on Minnesota in goals this season with 13 despite missing 15 games due to injuries already. Carolina could be set to get a pair of players back for their game against Detroit tonight. Michael Smith of the Hurricanes’ team website notes that defenseman Brett Pesce and center Derek Ryan could both be ready to return from their respective upper-body injuries. Pesce appears to be ahead of schedule as at one point, he wasn’t expected to be back until after the All-Star break. The Vancouver Canucks may be ready to ship off several players such as Thomas Vanek and Erik Gudbranson, but one player whose name doesn’t come up as often is defenseman Chris Tanev. Of course, in the past Vancouver has been reluctant to trade their top defenseman, who is a club leader and one of the longest-tenured players in Vancouver. However, The Athletic’s Mike Halford (subscription required) writes that this is the perfect time for the team to move the 28-year-old Tanev. While there are some solid defensemen likely to be available at the deadline, most are pending unrestricted free agents like Detroit’s Mike Green or Pittsburgh’s Ian Cole or are locked into long-term deals such as Ottawa’s Dion Phaneuf ($7MM AAV through 2021). The Canucks might get quite a return for someone like Tanev, who is locked up at a reasonable price at 4.45MM for another two years after this one. Tanev, who is known for making everyone better around him, could likely slide into more than half of any playoff team’s top four, making him quite valuable. Tracey Myers of NHL.com tweets that Chicago Blackhawks center Artem Anisimov, who has missed the last eight games with an upper-body injury attempted to practice today, but coach Joel Quenneville said he was “just OK” and might miss even more time. The 29-year-old Anisimov has 13 goals for Chicago this year.